The most popular rig used when fishing the plastic worm is the Texas Rig. To use this rig you simply place a bullet weight on the line above 4/O worm hook (hook size will be dependant on the size of worm you are using). The weight will slide freely on the line. Cast the worm towards some sort of shoreline cover or structure and let it fall to the bottom. You will be able to tell when it has reached the bottom when the line goes slack. Pay close attention to the line as it falls because frequently the bass will hit the worm as it descends. Once your bait is resting on the bottom, reel up the slack line and give the tip a couple little twitches. If this does not produce a strike begin to slowly hop the worm along the bottom or over the structure you are fishing. It is not necessary to move the rod tip a great deal to produce an effective movement of the worm. Generally I do not move the rod more than 6 to 8 inches. Granted the amount of movement needed will be determined by the type of area you are fishing. During your retrieve it is very vital to pay attention to your line. Should the line go slack all of the sudden chances are the worm is in the mouth of a bass. It is also very common for the line to begin to move sideways. This occurs when a bass picks up the bait and swims perpendicular to the direction of your cast. Should this occur reel up any slack line and set the hook. Almost anytime I fish a plastic worm it will be on a Texas Rig. Another great technique is the Carolina Rig. Although a little more technical than the Texas Rig it is still a relatively simple technique. To create a Carolina Rig, place an egg sinker or a Carolina Rig weight on your line. Like with the Texas Rig the weight should slide freely. Next tie a swivel to the line under the weight. Once this is complete tie a 12 – 24 inch leader of lighter line to the bottom eye of the swivel. (The length of your leader will be dependant on the area you are fishing) After this is done you attach your worm hook to the end of the leader. Generally I will use a smaller hook when fishing a Carolina Rig, most often a 2.5/O Gamakatsu EWG worm hook. Casting this rig is a little more challenging than with a Texas Rig because of the long leader but with a little practice it becomes second nature. The Carolina Rig is a very good method of covering a lot of water. Most often I will use the Carolina Rig when fishing main lake points or flats. Cast the worm to your desired target and let it fall to the bottom. Reel up the slack line and begin your retrieve by making short hops with the weight. You should be able to feel the resistance created by the weight as you hop it off the bottom. After each hop let the weight sit for a few seconds to enable the worm to fall back towards the bottom. Each time your weight comes in contact with the bottom slowly reel up any slack in the line. The way in which this rig is designed allows the worms to have a more lifelike presentation because there is virtually no resistance on the bait as it falls. Given the fact that it is weightless the worm will fall at a much slower rate than your weight will. When setting the hook while using a Carolina Rig reel up any slack and make a sideways sweeping motion with the rod. 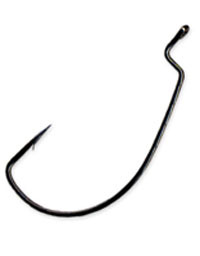 I have found that this technique has a greater hooking ration than simply setting the hook by jerking the rod tip straight upward. The Florida Rig is almost identical to the Texas Rig. The only difference is the weight on the Florida Rig does not slide freely on the line. Instead the weight has a small peg with a spring looking devise attached to it. This spring is used to screw into the head of the plastic worm and it will lock everything together. Although I am personally not a big fan of this technique, there are several anglers that are and it is up to each individual to determine their favorite methods. As far as the Drop Shot Rig is concerned I feel that this is a more advanced technique, which is more difficult to properly learn. For an indepth article with some great tips, check out Drop Shot Fishing. Now that you have learned the basics of the plastic worm it’s time to go out and give it a cast. Like with all techniques these will require you to get comfortable and gain confidence in your ability to consistently catch fish on a plastic worm. It just doesn’t happen all at once so stick with it and you won’t be disappointed. The jerkbait is perhaps one of the most underused tools in the average angler’s arsenal. A jerkbait can be far more versatile than it gets credit for. Often mistaken by many as only a cold water lure, they can really shine in warm water too. It’s also a great substitute for a crankbait or spinnerbait when they are not producing. My first introduction to lipless crankbaits, was when I won twenty of them in a raffle on Lake Cayuga in upstate New York. The following week, I tried in vain to catch fish with this noisy, skinny looking object. What I did catch was wood, weeds and rocks. So the lures remained in the bottom of the tackle bag collecting dust like so many baits that I believed were for catching fishermen, not fish!